Hey everyone, i thought i would take a moment and mention the fact that on May 31st this year, Gamespy will no longer support many of the older battlefield titles, including Battlefield 2.. (See Here: http://www.poweredbygamespy.com/pricing/ ). What does this mean for BF2Statisitcs? Well, we already have a login emulator, and im pretty familiar with the Gamespy protocol. I will be follow the status of this shutdown very closing, and watch to see what EA does about it (have a look here: https://twitter.com/OriginInsider/status/453955565182783488 ). I have recently moved the website to a new server, and it seems that the migration had gone bad. I have recently moved the website to a new server, and it seems that the migration had gone bad, so the DB was missing alot of info. I had to restore the DB from the other server from yesterday, so if you tried to register today, please do so again. Hey guys! Today I present you with my latest work, The Control Center . Think of this program as an "All-In-One" program of my previous releases. Basically, this program is a compilation of the Client Launcher, Server Launcher, and the Login Emulator. As of v1.1, The Control center also includes a Built-In Http ASP Server, Which will allow you to play without the need of installing a web server and database. 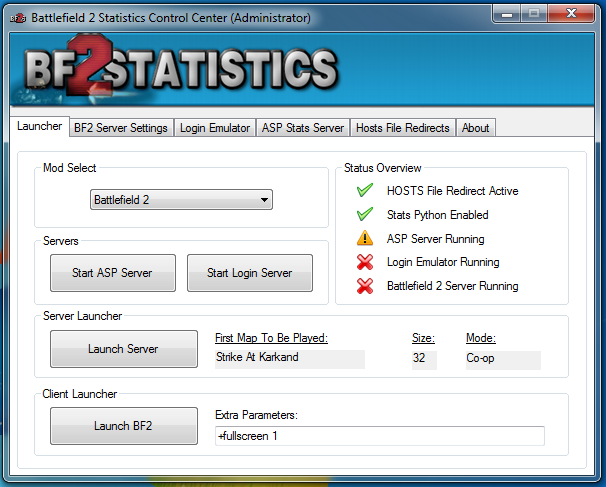 This program was made for people who play with the BF2Statistics system on their personal computer (Lan games with or without bots). Instead of having to use 2 or 3 different programs to get everything running, you can now use 1 simple GUI application to get everything going . This program has been tested extensively between My brothers and I (They used the Client Launcher, I used this). My brothers both live roughly 2,500 miles away from me, and the system worked great.